Avoiding gluten in your diet? If so, you might feel like you're missing out when it comes to dessert. Brownies? Cake? Cookies? Perhaps just the thought of these tasty treats makes you crave them even more. Of course, you don’t want to miss out on any of the fun that goes along with enjoying dessert, so here's sweet recipe for you! These Gluten-Free Cranberry White Chocolate Chip Cookies combine white chocolate morsels with dried cranberries, honey, and almond flour for a seriously delectable treat. 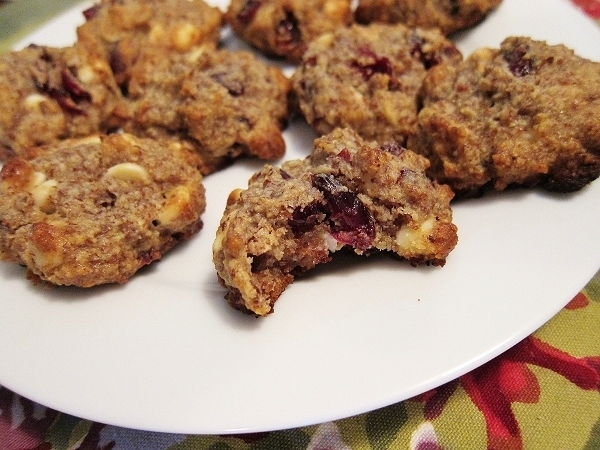 These cookies are soft, chewy, and loaded with bits of white chocolate and dried cranberries. They're some of the best gluten-free cookies I've ever eaten! Combine all ingredients in a large bowl. Mix well until batter is blended evenly. Refrigerate dough for 30 minutes. Remove dough from refrigerator. Roll batter into 1-inch balls and place on a greased baking sheet. Bake cookies for approximately 13-15 minutes until the tops start to lightly brown. Do Gluten-Free Diets Take Off Pounds?